In his deathbed, and with Callinicus (the praepositus sacri cubiculi) as the only witness to his last words, Justinian I designated “Justin, Vigilantia´s son” as his heir. Modern historians suspect Callinicus may have made up this last words to secure the succession for his political ally, as there was another nephew, and candidate for the throne: Justin, son of Germanus. Callinicus, together with other members of the Byzantine Senate also interested in this succession, informed Justin and Vigilantia and offered the throne, wich Justin accepted. 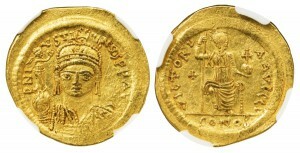 Only after the Patriarch of Constantinople crowned the new Augustus early the next morning, was the death of Justinian and the succession of Justin officially announced in the Hippodrome of Constantinople. 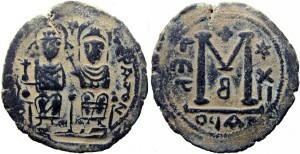 In the first few days of his reign Justin paid his uncle’s debts, administered justice in person, and proclaimed universal religious toleration. Contrary to his uncle, Justin relied completely on the support of the aristocratic party.